Leads to weakness, sore throat, fever, glands in the neck. Poison destroys healthy respiratory system tissues: the dead tissue forms a thick, grey pseudomembrane which can make it hard to breathe and swallow. Causes severe coughing spells, which can cause difficulty breathing, vomiting, and disturbed sleep. Can lead to weight loss, incontinence, and rib fractures. C. diphtheriae is an aerobic gram-positive bacillus. Toxin production (toxigenicity) occurs only when the bacillus is itself infected (lysogenized) by a specific virus (bacteriophage) carrying the genetic information for the toxin (tox gene). Only toxigenic strains can cause severe disease. The toxin causes local tissue destruction and pseudomembrane formation. The toxin produced at the site of the membrane is absorbed into the bloodstream and then distributed to the tissues of the body. The toxin is responsible for the major complications of myocarditis and neuritis and can also cause low platelet counts (thrombocytopenia) and protein in the urine (proteinuria). The onset of anterior nasal diphtheria is indistinguishable from that of the common cold and is usually characterized by a mucopurulent nasal discharge (containing both mucus and pus) which may become blood-tinged. A white membrane usually forms on the nasal septum. The disease is usually fairly mild because of apparent poor systemic absorption of toxin in this location, and it can be terminated rapidly by diphtheria antitoxin and antibiotic therapy. The most common sites of diphtheria infection are the pharynx and the tonsils. Infection at these sites is usually associated with substantial systemic absorption of toxin. The onset of pharyngitis is insidious. Early symptoms include malaise, sore throat, anorexia, and low-grade fever (<101°F). Within 2-3 days, a bluish-white membrane forms and extends, varying in size from covering a small patch on the tonsils to covering most of the soft palate. Often by the time a physician is contacted, the membrane is greyish-green, or black if bleeding has occurred. There is a minimal amount of mucosal erythema surrounding the membrane. The pseudomembrane is firmly adherent to the tissue, and forcible attempts to remove it cause bleeding. Extensive pseudomembrane formation may result in respiratory obstruction. Laryngeal diphtheria can be either an extension of the pharyngeal form or can involve only this site. Symptoms include fever, hoarseness, and a barking cough. The membrane can lead to airway obstruction, coma, and death. In the United States, cutaneous diphtheria has been most often associated with homeless persons. Skin infections may be manifested by a scaling rash or by ulcers with clearly demarcated edges and membrane, but any chronic skin lesion may harbor C. diphtheriae along with other organisms. Rarely, other sites of involvement include the mucous membranes of the conjunctiva and vulvovaginal area, as well as the external auditory canal. 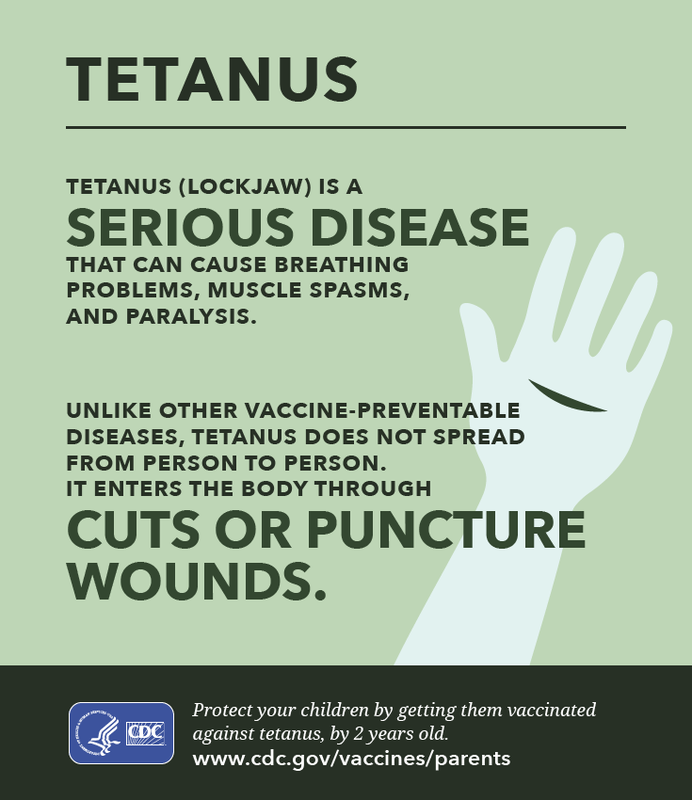 Tetanus is an acute, often fatal, disease caused by an exotoxin produced by the bacterium Clostridium tetani. It is characterized by generalized rigidity and convulsive spasms of skeletal muscles. The muscle stiffness usually involves the jaw (lockjaw) and neck and then becomes generalized. C. tetani is a slender, gram-positive, anaerobic rod that is sensitive to heat and cannot survive in the presence of oxygen. The spores, in contrast, are very resistant to heat and the usual antiseptics. They can survive autoclaving at 249.8°F (121°C) for 10-15 minutes, and are also relatively resistant to phenol and other chemical agents. The spores are widely distributed in soil and in the intestines and feces of horses, sheep, cattle, dogs, cats, rats, guinea pigs, and chickens. Manure-treated soil may contain large numbers of spores, and in agricultural areas, a significant number of human adults may harbor the organism. The spores can also be found on skin surfaces and in contaminated heroin. C. tetani usually enters the body through a wound. In the presence of anaerobic conditions, the spores germinate. Toxins are produced and disseminated via blood and lymphatics. Toxins act at several sites within the central nervous system, including peripheral motor end plates, spinal cord, and brain, and in the sympathetic nervous system. The typical clinical manifestations of tetanus are caused when tetanus toxin interferes with release of neurotransmitters, blocking inhibitor impulses. This leads to unopposed muscle contraction and spasm. Seizures may occur, and the autonomic nervous system may also be affected. Local Tetanus: an uncommon form of the disease, in which patients have persistent contraction of muscles in the same anatomic area as the injury. These contractions may persist for many weeks before gradually subsiding. Local tetanus may precede the onset of generalized tetanus but is generally milder. Only about 1% of cases are fatal. Cephalic Tetanus: a rare form of the disease, occasionally occurring with otitis media (ear infections) in which C. tetani is present in the flora of the middle ear, or following injuries to the head. There is involvement of the cranial nerves, especially in the facial area. The most common type (about 80%) of reported tetanus is Generalized Tetanus. The disease usually presents with a descending pattern. The first sign is trismus or lockjaw, followed by stiffness of the neck, difficulty in swallowing, and rigidity of abdominal muscles. Other symptoms include elevated temperature, sweating, elevated blood pressure, and episodic rapid heart rate. Spasms may occur frequently and last for several minutes. Spasms continue for 3-4 weeks. Complete recovery may take months. Neonatal Tetanus (NT): a form of generalized tetanus that occurs in newborn infants. Neonatal tetanus occurs in infants born without protective passive immunity, because the mother is not immune. It usually occurs through infection of the unhealed umbilical stump, particularly when the stump is cut with an unsterile instrument. Neonatal tetanus is common in some developing countries but very rare in the United States. Pertussis is an acute infectious disease caused by the bacterium Bordetella pertussis. B. pertussis is a small, aerobic gram-negative rod. It is fastidious and requires special media for isolation. The diagnosis of pertussis is based on a characteristic clinical history (cough for more than 2 weeks with whoop, paroxysms, or post-tussive vomiting) as well as a variety of laboratory tests (culture, polymerase chain reaction [PCR], and serology). The Catarrhal Stage: characterized by the insidious onset of coryza (runny nose), sneezing, low-grade fever, and a mild, occasional cough, similar to the common cold. The cough gradually becomes more severe, and after 1–2 weeks, the second, or paroxysmal stage, begins. Fever is generally minimal throughout the course of the illness. The Paroxysmal Stage: diagnosis of pertussis is usually suspected. Characteristically, the patient has bursts, or paroxysms, of numerous, rapid coughs, apparently due to difficulty expelling thick mucus from the tracheobronchial tree. At the end of the paroxysm, a long inspiratory effort is usually accompanied by a characteristic high-pitched whoop. During such an attack, the patient may become cyanotic (turn blue). Children and young infants, especially, appear very ill and distressed. Vomiting and exhaustion commonly follow the episode. The person does not appear to be ill between attacks. These attacks occur more frequently at night, with an average of 15 attacks per 24 hours. During the first 1 or 2 weeks of this stage, the attacks increase in frequency, remain at the same level for 2 to 3 weeks, and then gradually decrease. The paroxysmal stage usually lasts 1 to 6 weeks but may persist for up to 10 weeks. Infants younger than 6 months of age may not have the strength to have a whoop, but they do have paroxysms of coughing. The Convalescent Stage: recovery is gradual. The cough becomes less paroxysmal and disappears in 2 to 3 weeks. However, paroxysms often recur with subsequent respiratory infections for many months after the onset of pertussis.